lashes. These floggings were public and in front of a crowd of spectators. And to provide some more context, he just turned 32 this past January. He has a wife and three children (they are in Canada with a political asylum). 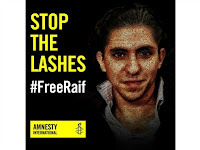 There has been an international outcry on the treatment of Badawi (for example, see Amnesty International and Human Rights Watch) - but to no avail. He continues to suffer while he awaits more lashes. According to Saudi newspaper Al Watan, the country's Commission for the Promotion of Virtue and the Prevention of Vice found that the 28-year-old man posted more than 600 tweets denying the existence of God, critiquing the teachings of prophets, and deriding Quranic verses. When questioned by the religious police, known locally as the Haia, the man reportedly refused to back down from his beliefs and maintained that he had the right to free expression. The court also fined him 20,000 riyals or $5,300. 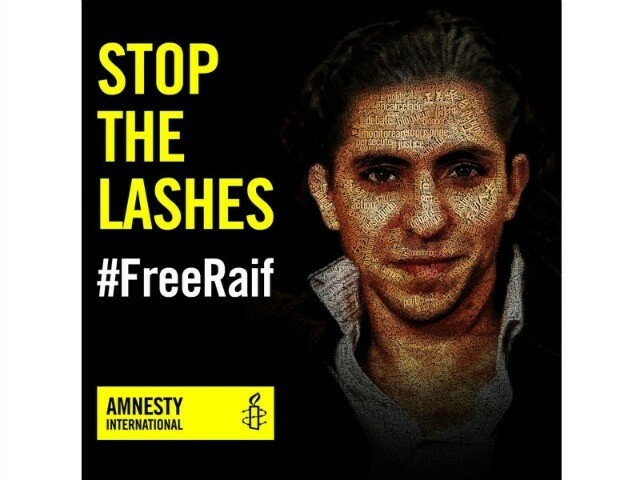 In 2014, Saudi Arabia introduced draconian new counter-terrorism laws that said atheists are the same as terrorists, criminalized all expression of dissenting speech, and gave the Interior Ministry the legal authority to jail people or spy on their communications without judicial oversight. Twitter had been a huge hit among young Saudis. In 2013, a study found that Saudis made up 4 percent of Twitter's users, almost as many as Spain and more than France or Mexico. One user said they believed Twitter was so popular in the country "because we are able to say what we couldn't say in real life. It's a breather from the suppression we live under, without fear." Earlier this month, a Saudi activist wound up with a 10-year jail sentence after he took to Twitter to call for the release of prisoners convicted of "terrorism." Saudi Arabia's Grand Mufti, the country's leading religious cleric, has condemned Twitter as "the source of all evil and devastation," which serves only to spread "lies and falsehood." The Haia, however, activated its own Twitter account last summer and immediately gained more than 66,000 followers. According to a report in the Saudi Gazette, the commission's leader Abdul Rahman Al-Sanad hoped that joining Twitter would improve public perception of the police.